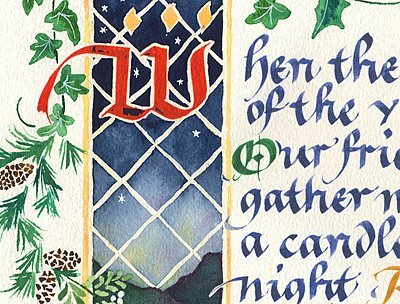 In 1990, I wanted to make a greeting card for my first card exchange with Pacific Scribes. I had never made a card “from the ground up,” so I wanted it to be special. I just could not find a verse by anyone that expressed my feelings about Christmas and winter solstice, so as a last resort I wrote one myself. This first version of The Longest Night was sketched in blue pencil, pasted down with rubber cement (horrors!) and run off on a copy machine. 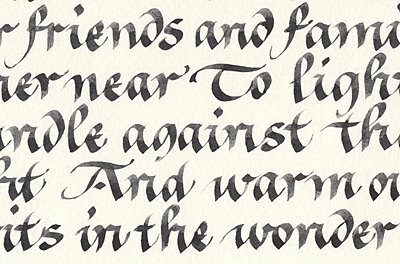 The calligraphy was a Carolingian style, one of the first I became comfortable with. The verse is simple, as my oldest child was five and explanations were kept simple and easy to remember. 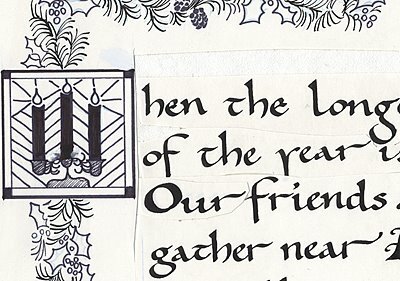 Bits of the border were hand colored with markers. This second picture shows my daughter’s contribution; this card was a collaborative effort. Three years later I decided to produce the card in quantity for sale to emerging markets. I prepared the artwork in three layers to be printed in three colors, registered carefully on tissue overlays. Here is the red layer. These cards were printed at what used to be called a quick print shop, using paper rather than metal plates. The flames of the three candles were afterward added by hand with a gold marker, making this a laborious card to produce. I sold this card for ten years. That is a lot of candle flames to mark! By this time, my second child was growing up and was roped into marking some of those gold flames. In 2004, at the urging of a friend who said The Longest Night deserved a nicer treatment, I rewrote it yet again, this time in my beloved batarde hand. By now I had enough Photoshop experience to approach the design in parts. I wrote the text in watered down black ink on my favorite Saunders Waterford hot press watercolor paper. After scanning it into the computer, I changed the color digitally to indigo. Then I printed it out on cold press watercolor paper. Since the calligraphy intersects the painting at a few points, this allowed me to tailor the painting to the calligraphy. I think you can see the texture of the cold press paper below; cold press watercolor paper is much better for blending and I wanted the sky glow to be soft through the window. 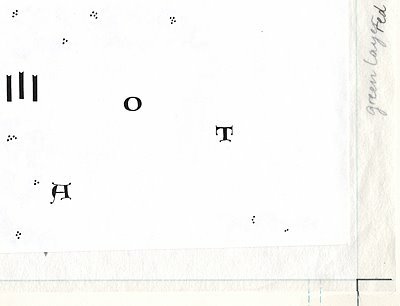 I used masking fluid in a ruling pen for the diamond window panes, and the initial W was done separately and scanned in also. I was at this point playing around with colored initials in the text block, but later dropped them. The painting was then scanned into Photoshop and all the parts composited for printing. This card was produced using 4-color process printing, using cyan, magenta, yellow and black to produce the colors, on white card stock. 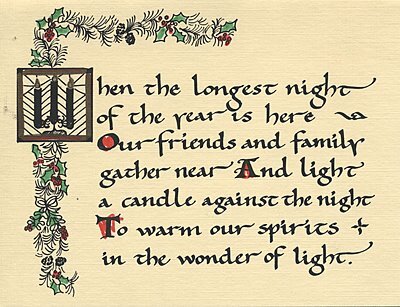 This card has been one of my longest and best selling designs at Prose and Letters for fourteen years. 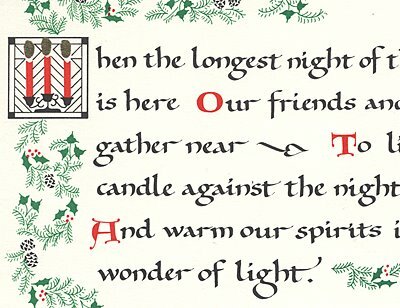 But the real reason it is my favorite is that I wrote the verse myself and it still expresses my feeling at the winter solstice. All of the socializing, colored lights, singing and gifts are really our way of driving the cold winter away, being together as we wait for the return of the sun and warm days again. Cari – this is a lovely card. It’s so interesting to read about it’s evolution. Thank you for sharing your story of your art piece – it makes your work even more enjoyable. Cari, thanks for the evolution. I still have people comment to me about the card, which I gave our a few years ago now. I love your Batarde, and I love your work. Thank you for sharing the beautiful steps you’ve taken.